The Last Taxi sports two apt leaders at the helm. Pianist, Patrick Battstone began performing music professionally at the age of 14, playing in various rock, blues, and R&B bands in South Western Ohio. By the time he was 18, he had received lessons from Stan Kenton and Gary Burton, had been mentored by Oscar Treadwell (Oska T. In 1973, he attended Berklee College of Music and soon after became a student of both Mme Chaloff and Charlie Banacos. One of his bands, which featured hometown friend Grover Mooney, opened the fabled 1369 Club in Cambridge in 1976. During the 80’s, Patrick studied the works of Scriabin under the renowned Serge Conus. In 1986, he resumed jazz studies with Joanne Brackeen in NYC for a period of six years. Richard Poole is a composer, collaborator and performing musician. On this project he command the vibraphone and drum chair. After attending Berklee in the early 1970’s, Richard moved to Miami, Florida and studied Music Composition (scholarship) at Miami International University, graduating in 1976. As a composer and collaborator, Richard has worked with many of the 20th century’s great jazz artists, including: Paul Bley, Mark Eagen, Don Bradon, Ira Sullivan, Curtis Fuller, George Garzone, Rebecca Parris, Johnny Walker and Jaco Pastorius. Battstone and Poole have a history of creating deeply moving chemistry with their previous collaborations, Through an Open Door and Mystic Nights were both deeply rooted in a chamber jazz moniker. On this effort, it was refreshing to see the two did not reinvent the wheel and kept firmly rooted in the essence of their “chamber jazz” while expanding the overall textural sound with the addition of Chris Rathbun on bass and Todd Brunel on bass clarinet. The result was a cohesive yet invigorating conversation that ebbed and flowed with rich dialogue and enthralling discovery. The spontaneity of each improvisation keeps the outing fresh and filled with surprise around every corner. The Last Taxi is meant to be savored, like the moments you spend with a longtime friend you have not seen in years; enjoy the moments and revel in the memories. Certainly a must add to any creative improvisational or avant library. Highly Recommended!! 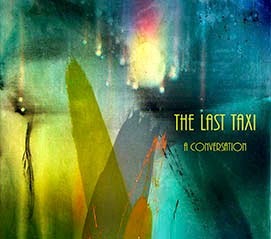 Be the first to comment on "Patrick Battstone and Richard Poole, The Last Taxi"